The following mutations are available in Australia. As Peter has already covered the descriptions (link here) I have only added brief notes where required. The 3 mutations mentioned above are in good numbers and commonly available. 4) Cinnamon Mottled Pied (Cinnamon Yellow). This mutation has been in Australian aviaries for around 10 years but no-one could explain how a normal bird would gradually turn to a complete yellow colour over time. We have been producing this mutation for the last 6 years and found that it is a mutation in it's own right. It is a recessive mutation and we strongly recommend pairing a split bird to a coloured bird. 5) Black eyed clear yellow - This mutation is relatively new in Australia and held in low numbers by a few breeders at this time. The exact genetic makeup of this mutation is still a mystery as test matings have revealed it acts differently to the Gold checked yellow from overseas. 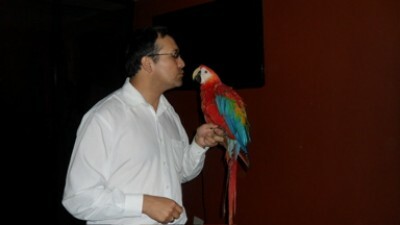 Very few birds are offered on the open market and still hold a value of around $5,000.00 per bird. 6) Dominant pied - This mutation has a large question mark over whether it is in Australia or not at this time. Several breeders claim their pieds are dominant but if that were true we would have been able to produce the gold checked mutation similar to what the Europeans have. It may take a little more time to establish it's existence here in Australia. So buyer beware if you are told the pair of pieds being offered for sale are dominants dont be surprised if they are in fact recessive. 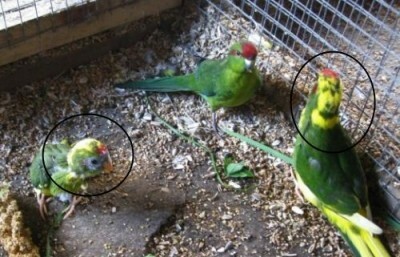 Reverse pied - We have bred our first reverse pied (yellow bird with green markings) recently. This result was not calculated and has now raised questions as to the genetic inheritance of the black eyed clear and dominant pieds here in Australia. There is still a lot of work to do before exact predictions can be tabled.  There are two more mutations that have been mentioned on this site elsewhere. Both the Red Suffused and Par Blue mutations are many years away from being available. 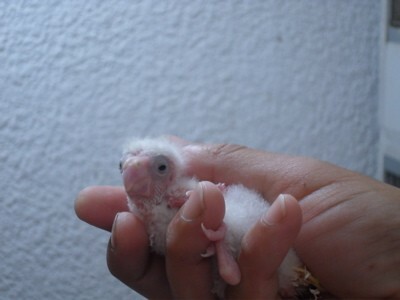 Hi friend, My name is Ricardo Trujillo, and I have a doub, well, I have some kakarikis, and I have 3 babys like a smodge but with teh red eyes...I dont now waht kind of mutation i have.?? Mutations, I think are a natural thing, I mean... they happen in wild birds whatever the species (as far as I know they seem to be 'relatively common' on indian ringnecks and budgerigars), so as far as they are bred with good standards and practices... I think they are not harmful. 1 .- From the vision of the species, a mutation may be an aberration, since it is more than certain that if a mutated lutino parakeet lived in the wild never get decensdencia, why could not camouflage. 2 .- from the standpoint of the breeder, we know that the beauty of lutino other than by an unmutated or wild bird, and from this perspective is that we as breeders, always looking for those mutations that extend beyond the natural way, no only a cosmetic issue but a matter of evolution of the hobby. Now we takekakariki... going on note of earlt settlers and scientist observing the native birds, they where astoned by the intensity of AND the number of types of mutations AND the % of the flock that had them. At the same time the huge flocks of kakarki where devitating the early settlers crops, and had to do something or they would starve. So out wth the shot guns...blast a flock with wide spread shot...the flock would rise up, and land again in range, let go of the 2nd barrel. Also around this time stoats, ferrets, rats possum where introduced, had a feild day, reduced wild stocks dramatically so that by the 1920s only a few isolated small flocks existed along side the vermin and formed a 'balance of nature' that prevented enough pairs to repoduce enough to recover. I know of 1 very old pure yellow in a small Zoo, seen a couple tiny yellow spots on a couple and a cuple with a white toe....all in captivity, all red crown.. the yellow is too old and will not breed , the others for some reason will not breed..or even pair up.....and the parents of those 3 have never thrown another mutation over several yrs. All ours where thrown by the same pair over several yrs. we have to keep them in a separate flight...they are ok together , but put one in a flight with others and its a full on rogue bird...serious attack. Hi every one, well i have news on one of the nest boxes i can see one chick of kaka green, but the rare is the color red on his fronted, this kaka have a very yellow color than red color. note, the parent does not are the hybryd. 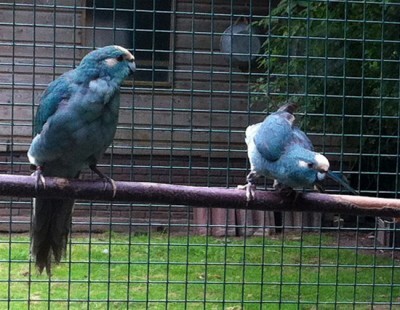 they are four genration of kaka on my birdroom. 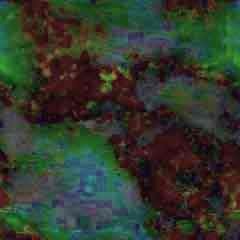 i put now other pictures...see i hope comments. 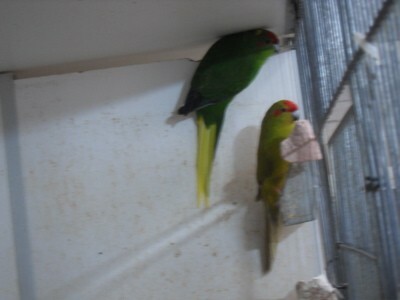 this is a recesive paid, they parents are male, green pied. hen, is a cinnamon. 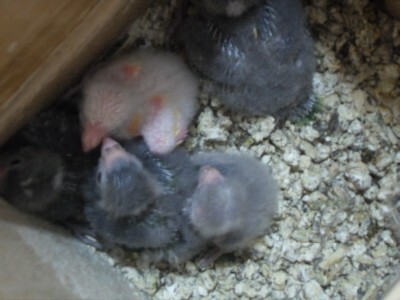 here, some ones of kakas,, chicks...note the color of eyes, note: they dont be lutino they have the ruby eyes without iris. i think they are some type of fallow or lacewing. THIS PAIR ARE PARENTS OF THE NEW AND RARE KAKA WITH THE YELLOW CROW..
How do you get a yellow crown from a red crown parent??? Yellow crown have a pale pure yellow crown. A note, the kakariki in the site banner at the top of the page ...is a hybrid, a bird given to me yrs ago. Ricardo, can you pls take a close up pic of the bird in the circle? Is it the bird you mean has a yellow front? It has faded cheekpatches (they are not well marked in red) so I think it could be a bird with hybrid blood. When breeding birds that have hybrids as ancestors, even if it was several generations back, sometimes you have a random chick that has more hybrid attributes. the answer is to easy, i don't know how! I think maybe is the some tipe of mutation. Well now how, I can test this : only way is to bred this new kaka with the hen green kaka. And the other way, maybe is the hybrid bird. Pablo from Spain telling to me the hybrid factor can be stay into the genes and is be really 3 or 4 generation after. well finally I hope to have a New mutation. Only the time give me if I do rigth or not. Tomorrow I send pictures of this baby. as we discussed via e-mail a mutation is not impossible. 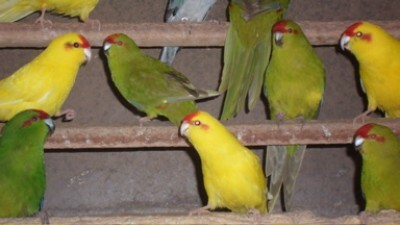 We have the example of the yellowcheek cockatiels. And then also it might be that we have yellow patches of the pied mutation around the edges of the crown (see pic). If possible take a few close-up pics of the crown, cheekpatches and iris, without flash. This is some discussion on the patch behind the ear...this may vary from a pale yellow, to none....It is not know if this is a loacality variation in the wild or having a patch even thu yellow is a sign of hybridisation. Many of our native birds..the fan tail in partiular vary from deep colours in the Nth of NZ to dull brown in the sth..they are the same species...and not strickly mutations. I doubt very much that anything outside these parameters is a new mutation...enough I would lay money on it, and Im not a betting man. Breed from these 'purer breed' and the chances ever getting a feather or a throw back is non existant. 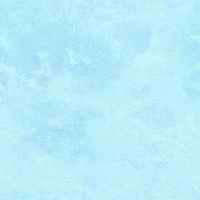 The yellow may vary from a pale yellow to a slightly less pale. Spontaneous mutation! The typical red-fronted Parakeet now has blue feathers!